Homes over 15 years old may benefit from a new air conditioner, furnace, or boiler. Generally speaking, heating systems that are more than 15 to 20 years old are inefficient by today’s standards. And because of all the recent developments in the air conditioning industry, cooling systems more than a decade old are candidates for replacement. Even some of the cheaper central air conditioning and heating systems on the market are more efficient than high-end models installed a mere 15 years ago. Wise homeowners combine the installation of new equipment with other improvements, such sealing doors and windows, adding more insulation and improving duct work. In doing this, they can see their energy savings begin to add up. How much insulation does a house truly need? The U.S. Department of Energy has created a fact sheet to helps homeowners decide if their insulation is sufficient for their given climate. Newer homes are often well insulated, while houses several decades old (or older) can often benefit from an upgrade. Because “hot air rises,” the attic is one of the biggest culprits when it comes to heat loss. Even some newer homes do not contain sufficient insulation in the room below the roof. In an under-insulated home, an extra layer of insulation could lead to savings and allow a homeowner recoup costs in a mere four or five years. By adding weather stripping or caulking around windows, a property owner can eliminate drafts and make a home cheaper to heat or cool. If taking this simple step is so effective, why would anyone want to spend the extra money to install new windows and doors? In buildings that feature older single-pane windows, sealing around the frame may not be enough. There are a few ways to save on costs associated with a home’s water supply. Installing low-flow plumbing fixtures – shower heads, faucets, and toilets – use the minimum amount of water needed to get the job done. Some models are adjustable, so whoever is using them can manually set their preferences. Another positive trait of low-flow shower and faucet fixtures is that they are relatively cheap to install. They will pay for themselves in a few months with the money saved on water bills. A new water heater is a more expensive, yet potentially more valuable upgrade. Tank-less Water Heaters produce hot water on demand rather than keeping it hot around the clock, thereby using much less energy. Standard water heaters have improved over the past decade in terms of efficiency, so any upgrade will likely result in water and energy savings. Many potential home buyers pay special attention to kitchens; therefore home improvement experts tell home sellers to focus on remodeling these areas. Because refrigerators and ovens are major energy users, investing in the most efficient models (an Energy Star-rated fridge and a convection oven) will save money immediately while also adding to the resale value of the home. 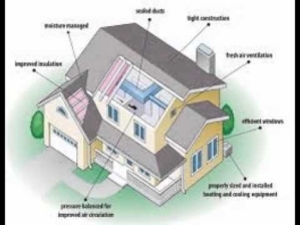 All of these improvements lead to energy savings, and most will also add value to the home. Homeowners who want to be certain that they are not missing any obvious improvements can enlist the help of an efficiency inspector. This expert will inspect the property and recommend the best improvements to amplify a home’s efficiency – ultimately saving the homeowner money and energy.